In the early decades of the Smith Opera House, touring theatre and opera companies regularly appeared on the stage. Traveling from larger cities and throughout the region, they usually performed for one day or night only. Given the large number of touring companies that passed through town in those early decades, we can assume that Geneva was a hospitable host to the visiting artists. One company, however, received a less than ideal welcome to the city. On May 21, 1898, the Joshua Simkins Opera Company arrived by train in Geneva, having previously performed in Trumansburg and Ithaca. 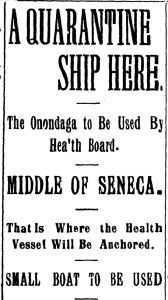 As the company prepared a procession through the streets to advertise their upcoming performance at The Smith, word came from a doctor in Ithaca that one of the company members was afflicted with smallpox and had been removed from the train before the company left Tompkins county. The May 23, 1898 issue of the Democrat and Chronicle reported that the company was initially quarantined within its own train cars, which were pulled away from town. The paper noted, “The show people at first strenuously objected, but their objections did no good and they had to submit.” The cars were sprayed with formaldehyde and guards were placed nearby to prevent company members from breaking quarantine and spreading the illness (“Geneva Is Pretty Thoroughly Scared” 4). The aldermen and the board of health of Geneva convened two days later and determined that to protect the health and safety of the community, the company would be further quarantined. The city specially leased the Onondaga steamboat for this purpose. As the Geneva Daily Times reported, before the performers could be transferred, the boat needed to be “cleaned and fumigated” after it was “raised from her resting place—in the bottom of the lake” (“Quarantine Ship” 1). Later Monday night, the 26 members of the company were placed on board. Stocked with supplies, the boat was then anchored in the middle of Seneca Lake. Reflecting back on this incident several decades later, one of the former managers of the Simkins Opera Company claimed that the company was held on the Onondaga for five weeks (“Last of Old Time Producers Here” 6). In the book Hidden History of the Finger Lakes, author Patti Unvericht claims the company “took the whole situation in stride, performing from the ship deck for those watching from shore” (70). Indeed, the Geneva Daily Times reported that on their first night on board the ship, the band played “Goodbye my lover, goodbye,” “Ther’ell be a hot time in the old town to-night,” and “The Star Spangled Banner.” Upon caching sight of members of the local board of health on the shore, the band concluded their impromptu concert with “Au revoir but not goodbye.” One of the members of the Simkins Company told a reporter for the paper, “Yes sir, you can bet your blamed old neck we’ll never forget Geneva, New York on the banks of Seneca Lake” (“They’re On the Boat” 1). For the residents of Geneva in 1898 the feeling was likely mutual. “Geneva Is Pretty Thoroughly Scared.” Democrat and Chronicle, 23 May 1898, pg. 4. 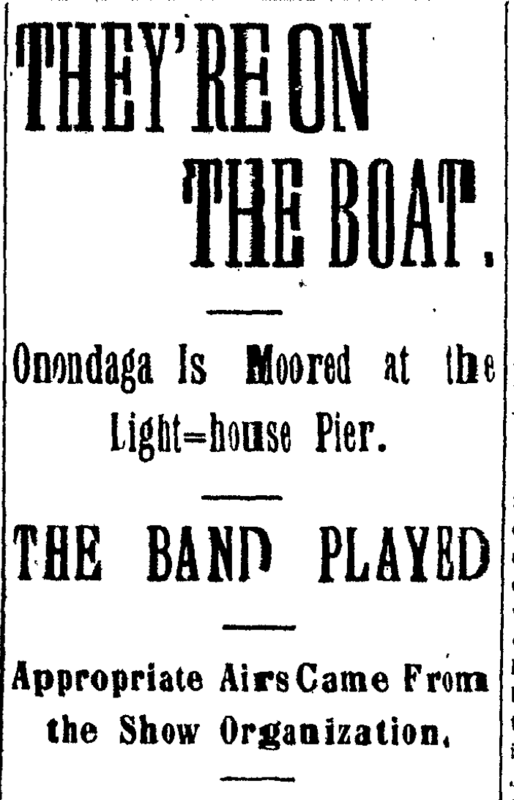 “The Joshua Simkins Opera Company Anchored on Board the Onondaga.” Democrat and Chronicle, 25 May 1898, pg. 4. “Last of the Old Time Producers Here.” The Post-Star (Glens Falls, NY), 18 June 1930, pg. 6. 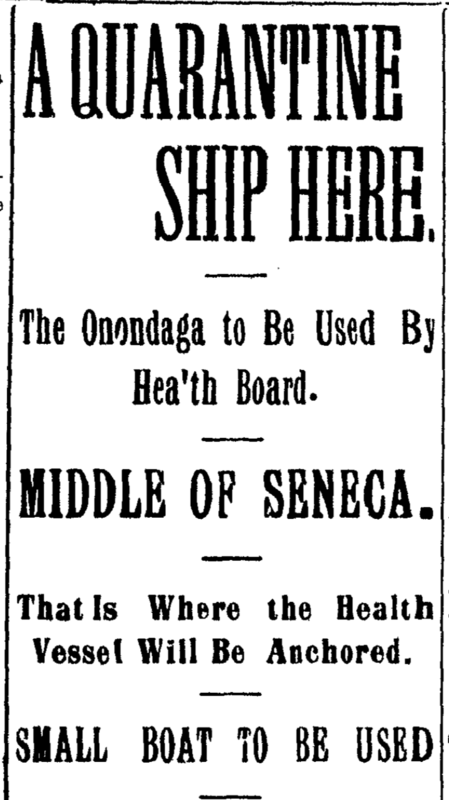 “A Quarantine Ship Here.” Geneva Daily Times 24 May 1898, pg. 1. 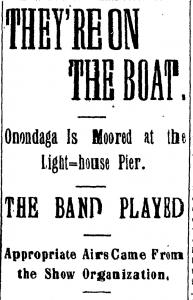 “They’re On the Boat.” Geneva Daily Times 26 May 1898, pg. 1. “Unvericht, Patti. Hidden History of the Finger Lakes. The History Press, 2018.